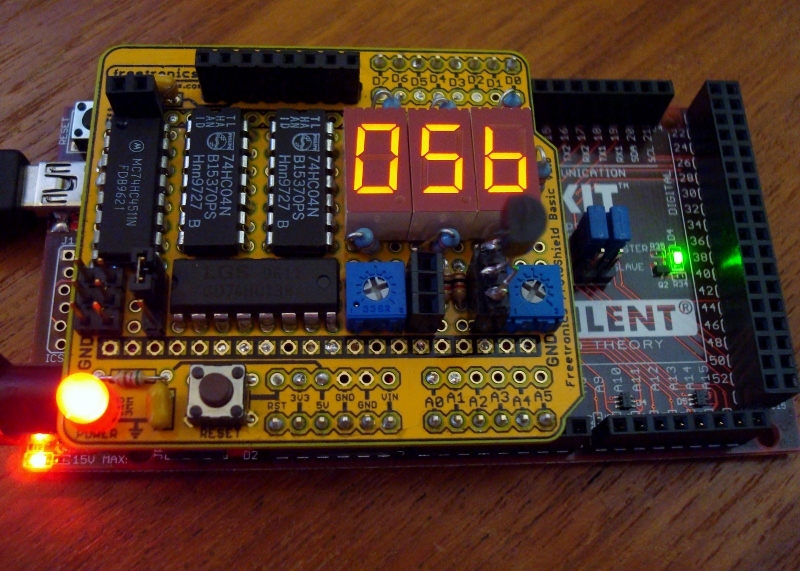 This is a dual thermometer shield for Arduino. It has ports for two temperature sensors (LM135, 235 or 335). One sensor is local, and another can have an extended length of three conductor wire and encased in shrinkwrap tubing for weatherproofing. The shield alternately displays the state of each of the temperature sensors in Fahrenheit. The temperature sensor portion of the circuit is tiny, less than a quarter square inch. The majority of the circuit area is for the seven segment LED drivers. The LED circuit includes 74HC4511 (one 7-segment led driver), 74HC138 (demultiplexer for led selection), and two 74HC04 chips (logic inverters). Only one LED segment is lit at any one time, using interlacing it appears that all three are lit at once. Using the 7-segment driver, only the digits 0-9 can be displayed, no negative numbers. Voltage regulation is very important for this circuit, as a change in voltage will result in a change of reading. Potentiometers are included for calibrating the sensors. Headers are included for SPI and 5V power, to support a custom Ethernet adapter and custom SD card adapter. Using pass-through connectors for supporting a shield on top of this one was not a priority. A jumper is provided for running the circuit at 3.3V, but 5V operation is preferred for LED brightness; and due to the 74HC chips, the logic is compatible with any 3.3V Arduino that can source 5V power. This shield was built on a ProtoShield and has been successfully tested with the 5V Diavolino (Arduino Duemilanove clone), 3.3V chipKIT Max32, and 3.3V GHI Electronic's Panda II.